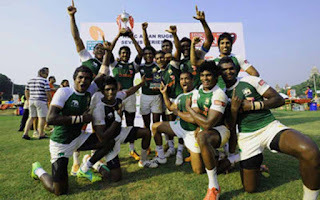 Sri Lanka Rugby Sevens(7) team beat Malaysia to win Plate championship at HSBC Asian Series Mumbai 7s. Sri Lanka beat Malaysia by 22-17 at the Gymkhana Club in Mumbai.The Full time of plate finals end as 17-17,in extra time Sri Lanka managed seal the game through a try. Sri Lanka Srinath Sooriyabandara scored two tries while Nigel Ratwatte and Suhiru Anthony scored a try each. Sri Lanka earlier beat Phillipines by 31-19 to enter Plate Finals. Sri Lanka were able to win Bowl Championship at Borneo Sevens as the first leg of Asian Rugby 7s series and continue their form at China by winning Plate championship at Shanghai 7s. Sri Lanka 7s team will play their next 7s tournament in Singapore November 02nd and 3rd at Singapore.